I’ve selected my next knitting project. I wanted something a bit more adventurous than another pair of socks, and I think this sweater, called Sensational Shirttail will be just the thing. 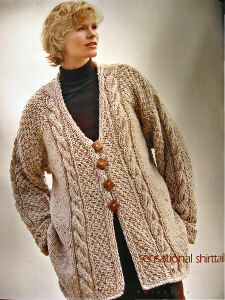 I found this in The Best Of Knitter’s Arans & Celtics book. I like to wear big. slouchy, comfortable sweaters. This pattern has enough cables and moss stitch to be interesting without having so much pattern that it requires a great deal of thought. And, on size US 10-1/2 needles, it should knit up fairly quickly, thus satisfying my short attention span and almost guaranteeing that I can get it finished before it’s cold enough to wear it. Of course I required a great yarn, so today I headed over to All About Yarn to see what I could see. And this was what I found! This is Noro Kochoran in color # 31. 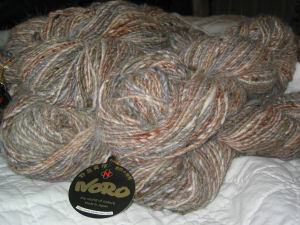 It’s a yummy blend of 50% wool, 20% silk and 30% angora, and is hand dyed in Japan. On my monitor the picture is fairly close to the correct color, but is maybe a bit dark. The major color is sort of a greyish sand, with rust, white, blue, grey and brown. It should go with anything. Now I just have to find the perfect buttons! Click either of the pics for the bigger version. I love deadlines. I especially love the whooshing sound they make as they fly by.